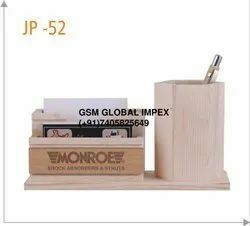 Teak wood geme stone painting table office set with lecker on it. User can keep it 100 years colour will not go out & user can keep it in son light it will not effect. Polished pen Stands made of MDF board. Can also be used as visiting card holder and other orgainser purposes. 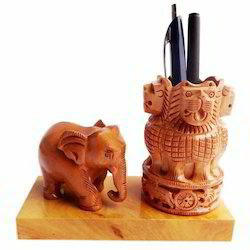 Fine Decorative Wooden Gemstone Pen Stand Available In Different designs & Sizes. Being a foremost organization in this industry, we are actively engaged in offering the finest quality range of Wooden Carving Handicrafts. Item Size: H-5.5", L-3", W-3"
We are also manufacturer of wall candle stands, antique wooden candle stands, decorative wooden candle stands, designer wooden candle stands, decorative stands, wooden tands, double bracket, wall bracket, ends, curtain holders. Fine Decorative Wooden Deer Pen Stand Available In Different Designs & Sizes.